This blog post could end my indie career. I don’t normally write about political or other emotionally charged subjects, but I can no longer stay silent on the subject of the editor, David Gatewood. Like so many people, I’ve been taken in by his charade. I’ve bought the books he’s edited, watched him on social media, lamented the fact he’s no longer accepting clients. I know now that I, like so many others, have been duped. On the surface, David Gatewood, is just a man helping indie authors find success in the new world of publishing. On the surface, he’s a kind man, a gentle man, a generous man. But the information I’ve uncovered over the last nine months paints a very different picture. A picture of a man intent on using his position of power to unleash darkness on the world. A picture of a man that must be stopped. This is a long post, far longer than my normal entries but the information it contains might save your life. I urge you to take the time to read it. Gatewood’s rise to fame is well known. He appeared out of nowhere, contacting the then up and coming indie author, Hugh Howey with unsolicited corrections to the author’s book—Wool. In a blog post dated July 22, 2013, Howey announced that, with his support and encouragement, Gatewood had decided to “hang a shingle” and offer his services as an editor. As I investigated Gatewood, I wondered whether Howey was party to his plans at this point, but I know now that he wasn’t. Howey’s involvement was an unfortunate happenstance. In mid-2014, when I was looking for an editor for my own work, I remembered Howey’s recommendation and began looking into David Gatewood. I was surprised to find that although he has an official website, there is very little information on his background, beyond the statement that he lives in Richmond, Virginia and has a wife and two kids. Beyond that, the meagre “facts” about him are simply a rehashing of Howey’s own story. Puzzled, I began to dig deeper. Contacting the authors Gatewood had worked with, enquiring as to the quality of his work and their satisfaction with the same. In fact, the words appeared in every single reply. And when I checked Howey’s blog, I found the exact same comment. In less than a year, David Gatewood had gone from being a reluctant freelancer to the darling of the indie editing world. His editing schedule was filling by the day, his books were a massive success, and his authors constantly lavished great praise upon him. How was he doing it? Was it simply the quality of his work? His sense of humour? Hugh Howey’s recommendation? Or was it something darker, more sinister? The answer to that question came, indirectly, in the form of an anonymous email I received one July morning, almost a year to the day after Howey’s Gatewood blog post. I’ve since deleted the email, at the author’s request, but there’s little to be gained from reading it anyway. It was unsigned, the return address a nonsensical Gmail account that now bounces any messages sent to it. The content of the email was just a link to a web page. My first instinct was to dismiss it as spam but something stopped me from deleting the mail. Instead, I followed the link. It led to a now defunct site containing only a single page—a news report about a fire in a small town in Massachusetts that had claimed the lives of five people. At the end of the report was a single word, presumably added by my anonymous correspondent. That word was Gatewood. Feigning illness, I took some time off work and flew to Boston. From there I hired a car and travelled north. Despite being led astray several times by the poor quality GPS in my car, I eventually arrived at my destination—Arkham—and immediately set about investigating the fire. The town’s newspaper, The Arkham Gazette, was of little help. The staff there directed me to the appropriate records but the brief article contained therein offered barely more information than the web page I’d been sent. Quashing my disappointment, I obtained the address of the house and went to investigate. The house had been on a hill at the edge of a large forest. Very little remained of it, just a blackened patch of earth, scattered with charred wood and a few scraps of faded yellow police tape. Although it was summer, the sky was filled with low, grey clouds and there was a chill wind blowing. The nearby forest was dark, the dense clumps of trees blocking any sunlight. Combined, the inclement weather and the dimly lit forest created an altogether sinister ambiance. I found myself eager to return to Vancouver as soon as I could. Still, I was determined not to waste my visit. I picked through the remains of the house, not really expecting to find anything. But find something I did. It was a book, buried beneath a pile of charred wood. The red leather cover was scorched and many of the pages had burned away completely but there were enough intact for me to determine that it was a diary. The handwriting was small and dense. I’m sorry to say my eyesight isn’t what it was and it was difficult to read. After a few minutes of trying to decipher the diary’s contents, I decided to return to my hotel room where the light would be better. I tell myself that was the only reason I wanted to get away from the carcass of the house but I’m not fooling anyone. It took me several hours to decipher the handful of pages that had survived the fire, but it was worth it. The words the diary held told the true story of Gatewood’s birth. He is not, as he suggests, simply an editor. He is something far worse. The man who contacted Howey was not the David Gatewood we know now. He was a fanatic, intent on using Howey’s work to summon a being of immense power. The “improvements” he made to Howey’s book, Wool, were not the editorial corrections Howey took them to be. They were more than that. They were adjustments, some of them incredibly subtle, that wove magical energies into the story. Energies to summon a creature from the depths of space. Howey’s book began to sell. As it gained momentum, so did the summoning until, one winter’s night in 2013, a gateway opened and through it came a malevolent being the likes of which have not been seen on Earth for dozens of millennia. The being, whose true name was thankfully lost in the fire, took possession of David Gatewood the fanatic and became David Gatewood, the editor. If you doubt this at all, I offer up his name as proof. Gatewood—one who came through a gate in a wood. Needless to say, once I’d deciphered the diary, I got the hell out of Arkham, immediately driving back to Boston and getting on a red-eye back to Canada. I slept on the flight but my dreams quickly turned to nightmares filled with visions of the horrors that lurk at the edges of the cosmos, waiting for the foolish or the insane to give them passage into our world. The uneasy sleep left me tired and distracted. During my layover in San Francisco, my carry-on luggage, the case containing the diary, went missing. Despite the best efforts of myself and airport security, we couldn’t find any sign of the bag or the person who took it. The diary was gone, stolen along with a change of clothes and my toothbrush. In the days and weeks that followed my trip to Arkham, I tried to ignore what I’d read. I tried to convince myself it was all just a hoax. I’m a software engineer. Logic, not superstition informs my worldview. There couldn’t be cosmic beings out there in space waiting for the opportunity to destroy the world. I moved into a new role at work and threw all my attention into the project, trying to make myself too busy to think about Gatewood’s machinations. It almost worked. It probably would have if it hadn’t been for Gatewood’s Facebook posts. Using a fake account and posing as a would-be customer, I befriended Gatewood and began watching his posts. I quickly spotted a pattern. Just finished editing the stories for the new anthology. 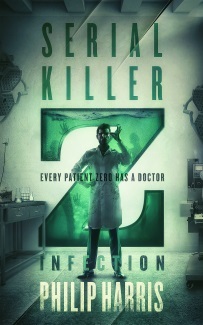 This one is going to be a hit. Looking forward to a nice evening out with the wife and kids today. Hugh Howey is such a nice guy. I tracked down a handful of interviews with Gatewood and found more evidence. It’s harder to edit short stories. The goal with all the editing is always just to make sure the author is coming off with their best possible voice. The curse of being self-employed is that you’re always at work. It was there in front of me, too obvious to ignore. David Gatewood was using an artificial intelligence to fool the rest of the world into thinking he was merely a human being. His presence on Facebook and on podcasts was a carefully created construct designed to lure authors to him. It was good, almost indistinguishable from a real human being. Whatever technology Gatewood was using far outstripped anything mankind was capable of. I’ve been working with computers for over thirty years—Gatewood’s technology must be of alien origin. The question I needed to answer next was what was his goal? Why was he building a stable of the brightest and best indie authors? And what was he going to do with them once it was complete? For that, I turned to the writing. I gathered together the books Gatewood has edited. I read them, searching for meaning. Then I read them again, two, three sometimes four times. The weeks dragged by, and still I couldn’t find a connection between the plots or the authors. What had a story about a giant octopus got to do with 911? Was there a link between the fan fiction anthology Tales of Pennsylvania and the romance of Howey’s The Shell Collector? What did Michael Bunker, Samuel Peralta and Meilin Miranda have in common? And then, one September afternoon, I found it. I’d been looking too closely. I’d been trying too hard, searching for connections that didn’t exist. The key was the titles and the message was clear. The dark age made of stars. Gatewood’s goal was, and still is, nothing less than the return of the Old Ones. And with them, would come the waters—a flood to wash mankind from the Earth. I was stunned, lost. I had no idea what to do with the information I’d uncovered. I couldn’t go to the authorities, I no longer had the diary or the email. I briefly considered taking things into my own hands and tracking down, and killing, Gatewood myself. But I’m not good at violence. I became paralysed by the immensity of the threat. The consequences of any action I took seemed so great that I was too scared to do anything at all. In desperation, I emailed the anonymous informant that had directed me towards the Arkham news article. I explained what I’d found at the house, about Gatewood’s use of an advanced alien AI, and the plan I’d uncovered in the books Gatewood had edited. I begged him, or her, to meet with me, to help me decide what I should do. It was three long, desperate days before I got a reply with a date, time and a location. As soon as I saw the address, I knew the identity of the informant. You’d recognise him too but I’ve promised him anonymity. For his sake, and the sake of his family, I’ll call him John. That’s not his real name. We were due to meet on the Saturday, a week later. That was the longest seven days of my life. My investigation had clearly attracted the attention of someone. Twice I noticed a dark sedan following me to work. My cell phone became sluggish, and when I turned on my PC each morning, I kept finding my anti-virus had discovered some new infection. By the time Saturday came around and I finally left to meet John, I was a nervous wreck. Three men in dark suits followed me into the airport, hanging back while I pretended to take pictures and then trailing behind me as I circled aimlessly from store to store. I tried to take photos of them using my phone but my previously fully charged battery died before I could get the chance. One of them boarded my plane and sat a few rows behind me. Every time I glanced back to see what he was doing, he was watching me. There was no sign of the man in the dark suit when I switched flights in Denver but still, I spent the flight looking around the plane, trying to spot anyone paying an unhealthy amount of interest in me. John met me at the airport and drove me to his house. It was early evening and after he’d introduced me to his wife and his dog, we ate. The food was delicious. While we dined, we talked about normal things—pets we’d owned, cities we loved, countries we’d visited. We avoided any mention of John’s books or David Gatewood. But after the meal was eaten and the dishwasher loaded, John took me into his office. He showed me the books he’d written, books David Gatewood had edited. He showed me the foreign editions, the fan mail he received, the accolades. All down, in part, to David Gatewood’s skilled editorial hand. I frowned, not really sure what he meant. He took a deep breath and turned around, pulling down the neck of his shirt. There, attached to the top of his spine, was a slug-like creature. It was about two inches long and a mottled brown colour. Its body pulsed slightly. The skin on John’s neck around the creature was red and inflamed. I shuddered as I stared at the creature attached to John’s spine. “I need you to remove it,” said John. I started to protest but the desperation in his eyes cut me off. I nodded. He thanked me and left the room, coming back a couple of minutes later with a pair of metal tongs and a glass jar with an airtight lid. He handed them both to me, then slipped his shirt off his shoulders. I popped open the jar, and then studied the creature for a while, trying to find the best approach to take. In the end, I just grabbed it in the middle and pulled. John tensed as the creature popped clear of his flesh with a wet, sucking sound. The slug-thing writhed and twisted, and almost broke free of the tongs. I dropped it into the jar and closed the lid. It wriggled around for a few seconds and then lay still. I looked at the thing in the jar and wondered how I’d get it through customs. I needn’t have worried. By the time I’d said goodbye to John and his wife, and taken a taxi to the airport, the creature was gone. All that remained was a fine powder, like brown sand. I dumped the jar into a bin on the way into the airport and caught my flight home. A woman in a black suit followed me off the plane. I saw her again as I passed through customs and again when I boarded the Skytrain to take me home. She couldn’t have looked more like a government agent if she’d tried. 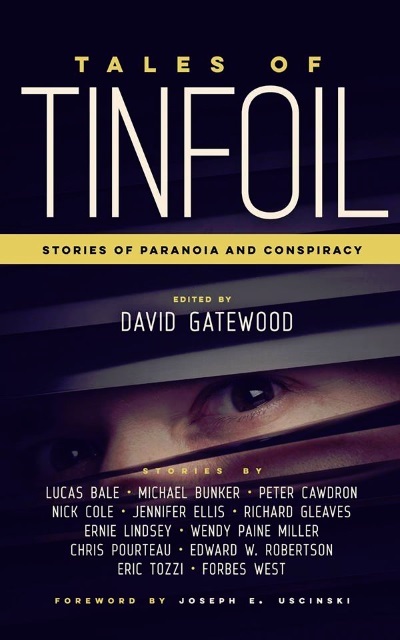 If the facts I’ve outlined above aren’t enough, I present to you David Gatewood’s next release – Tales of Tinfoil. Just look at those names. How could one man gather together so many talented people without the assistance of extraterrestrial intelligence and the power of the Great Old Ones behind him? It took me a long time to work up the courage to write this post. I have no evidence to prove what I’m saying is true but I can assure you it is. I’m risking everything by putting this out there, including my life. David Gatewood is trying to bring about mankind’s destruction and together, we need to find a way to stop him. If you have information you think may help, anything at all, please get in touch. Before it’s too late. Hilarious. It was meant to be, right? I don’t care, the slug thing and the destruction of humanity is a small price to pay for book sales.